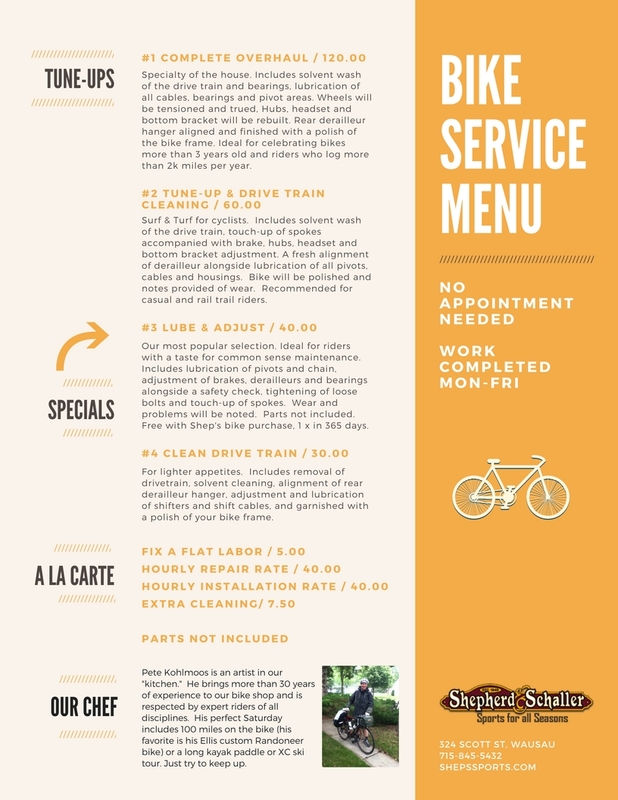 Hungry for bike maintenance and repair that will leave you satisfied? Shepherd & Schaller has a dish for you! No reservations necessary. Welcome all cyclists craving quality and experience well as a taste for commitment! Shepherd & Schaller is Wausau’s favorite Outdoor Store and home of Raleigh and Scott bicycles and experts who know how to help you choose the right bike for your goals and budget. When maintenance or repairs are called for, there is no one with more experience than Shep’s. With respect for the parts and ingredients he uses and finesse for getting the most flavor and performance from each of them, Pete Kohlmoos with the chef you’ll want on the job. We’re no “fast food” bike shop. Come for the service and stay for the flavor. You’ll be back again and again. Previous Previous post: Where do you like to Hang Out?